Time has come, now is the time to make a post on this. Is it too late? Anyway, I have been wondering when to write all this time as AKB48 is now a very famous even out of idol otaku. If you happen to follow Japanese pop music or culture, you would’ve heard of it. Today we can hear about them everywhere, everyday because their songs are still on the weekly ranking. I didn’t think about this way, I mean, I have never thought they could be that popular like this. Don Quijote in Akihabara has AKB48 theatre. Anyway, what is AKB48? Before that, anybody who knows about them, raise your hand. I wonder how many people out of Japan know about them because there are even foreign fans. AKB48 is a mega idol group which was born in Akihabara[秋葉原] where is a holy place for otaku. It consists of three teams, A, K, and B. When they started, there weren’t 48 girls. But now they are. Those cute girls are almost from 13 to 24 years old, very young, and chosen by audition. 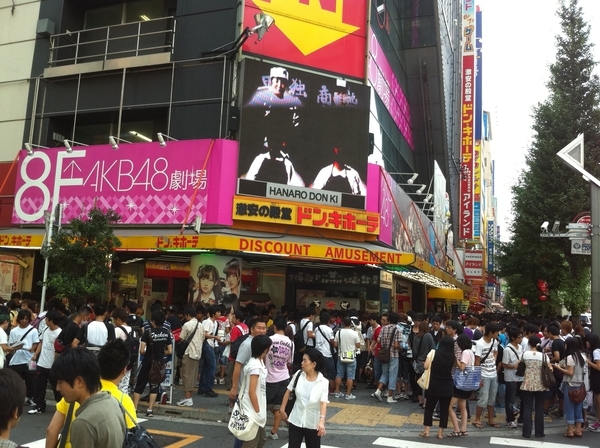 The show happens at AKB48 theatre in Akihabara almost every single day. (now it’s changed, I’ll explain later). The manager, Yasushi Akimoto[秋元康] introduced a new concept when he created AKB48, that is 会いドル[aidoru], abbreviation of 会いに行けるアイドル[ai ni ikeru idol], meaning the idol you can go and see. Long time ago, the distance between idols and fans is very far. Fans had to go to such a big concert hall. Even that, the idol on the stage is so far away from you unless you get a S-class seat. But AKB48 theatre is so small that you can see them close. When AKB48 started in 2005, I was not so interested in them because their performance was not so professional. Yes, even though they were well-trained, the dance and singing were not so good. But that was actually the scheme Akimoto planned. Normally, idols have to dance very well like ARASHI[嵐] or SPEED. However, AKB48 could require some patience as they are still amateur. That might be the point fans love. I think I introduced 素人萌え[shirouto-moe] before, but AKB48 is not just a bunch of amateur girls. As you see them, you would be able to see how well they get better, I mean, a wrong step at tonight show is going to be right tomorrow. In this way, they show you such an improvement. We can say 成長系アイドル[seichou-kei idol]. 成長[seichou] means growing-up, and 系[kei] is a type. I think the level of the dance is now much higher than before. I quickly asked people around me how they feel about AKB48. Even people who do not know about them say the dance is good and they are all united. Also they are even cuter than before. Agreed, I know some of the girls have been in the group from the beginning, and they’ve become cuter. In fact, my sister really loves AKB48 even though she is not an otaku at all. She recommended me to listen to the songs, and now I am hooked, too. Okay, for those who don’t know them, I shall introduce some must-know girls. She is Yuko Ohshima[大島優子] from team K. Her nickname is Korisu[コリス] or Yuko. She used to be No. 2, but last year she became No. 1 so now she is at the center. Most of the fans assumed she would be No. 2 in the last election, but on the last minute that happened. She could be No. 1, defeated Atsuko Maeda. She was actually a child actress years ago, so she had some experience in the entertainment industry. She is Atsuko Maeda[前田敦子] from team A. Her nickname is Acchan[あっちゃん]. She used to be No 1, and she had been at the center for so long. But at last she was defeated by Yuko. But she is doing well out of AKB48 as she also works as an actress. I wanted her to keep being No. 1 in fact. Keep going, Acchan! She is Mariko Shinoda[篠田麻里子] from team A. She has been in AKB48 from the beginning, and elder than any other girls even though she is 24. She seems to care about it, but she is still No 3. Because she doesn’t pretend to be a goody-goody, she is admired by women. She is Tomomi Itano[板野友美] whose nickname is Tomochin[ともちん]. She has becoming popular more and more. I assume she would do better if there is a next election. The rumor has it that she got a cosmetic surgeon because she looks different from who she used to be. What do you think? She is my sunshine, my angel, Mayu Watanabe[渡辺麻友] whose nickname is Mayuyu[まゆゆ] from team B. Oh my god, before I got hooked, I had a crush on her. Now she is my angel. No Mayuyu, no AKB48. Why does such a moe-girl exist in reality? Yes, fans are saying her face is like CG. Looks like an anime bishoujo. Too bad, she was No 5 in the last election. She cried out for her place, and claimed she is going to do better next time. Yes, keep going, Mayuyu! がんばりまゆゆ^^ Meanwhile, she is actually an anime otaku. Her favorite is Kuroshitsuji and Hetaria. And she also plays Tokimeki Memorial Girls’ Side. Mayuyu, do cosplay! I will definitely get a much better place! Above girls are first top 5 now. But I am sure things will change soon. AKB48 is too busy to do a regular show a lot. Now only once a month or so, a show happens. Even it happens, some of the lead girls are absent. That’s too bad. They are not 会いドル anymore…In fact, you could buy a ticket if you lined up. But now, you have to register for the agency, and win a seat. That depends on your luck. So it’s pretty hard to go see AKB48. Luckily, my colleague won a ticket so we went last Tuesday. It was my first coming the show. But too bad, my angel Mayuyu was absent! Ugahh, next time!! まゆゆに会いたい！Oh I should mention a new term, 推しメン[oshimen]. It’s like a fan-made word, abbreviation of 推しメンバー[oshimember], meaning your favorite. 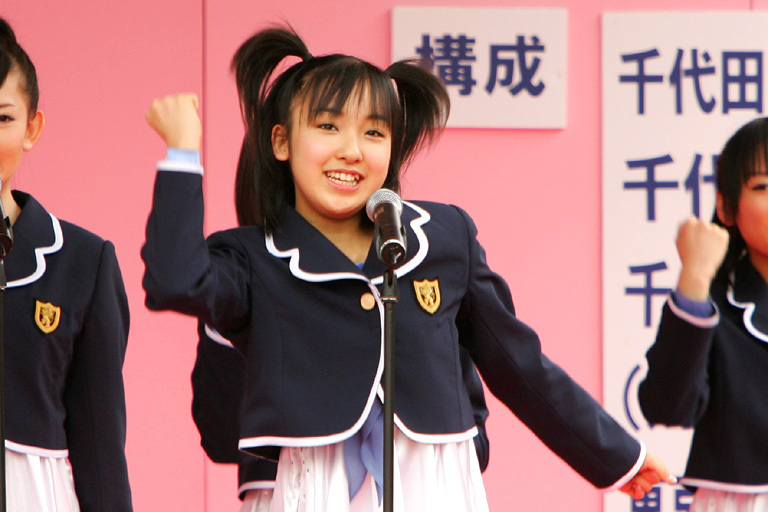 Now that AKB48 is such a popular group, they could be ﻿charismatic among schoolgirls. They always wear pretty uniforms so that even kids try to copy. I was a bit surprised to see some elementary schoolgirls were trying to copy AKB48’s fashion. At the graduation ceremony, they were wearing a blazer, a mini-skirt, and over-knee socks. I like AKB48’s uniforms, too. Do I have 制服萌え[seifuku-moe]? No matter what, AKB48 is going to do well for more 2 or 3 years, I assume. That is a pity, idols can’t carry on for so long because anybody gets old. That’s why they have to find a new life after they finished an idol. Mostly it would be either an actor or a solo-singer. Anyway, by the time they get less popular, I wish I could see Mayuyu. For more information, please go to their official site. English and Chinese are available. Yes, time is right. I have been waiting for a chance to cosplay this. But before you read this entry, please review what otomen is. 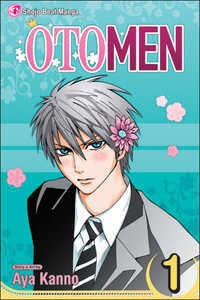 This term was born in the same title shoujo manga, Otomen[オトメン]. In this manga, the hero is Masamune Asuka[正宗飛鳥] who is seemingly a gentle schoolboy. He is so popular among other girls because he is so manly and cool. But actually he loves to read shoujo manga, collect cute stuff, decorate his room with that kind of thing. Also, he is good at sewing, and cooking so that he makes a lovely lunchbox and sweets. However, he pretends to be manly in front of everybody else because his mother wants him not to follow that kind of thing. His father left his mother and Asuka because he was actually gay. That is why his mother strongly hopes Asuka is going to be a manly boy. Asuka is not gay, though. But when he has a crush on his classmate, Miyakodsuka Ryo, he is afraid of being the real him. After all, Ryo accepts his otomen side, and they start to date. I was really happy to find this manga. This is my Bible! lol The author, Kanno Aya is great as she made such a wonderful term, otomen. The more I read, the more I felt sympathy towards Asuka. No, he is a carbon copy of me. I am the original.^^ Can I claim copyright? [Intermission] A Happy New Year!! A happy new year, everyone! How was 2010? 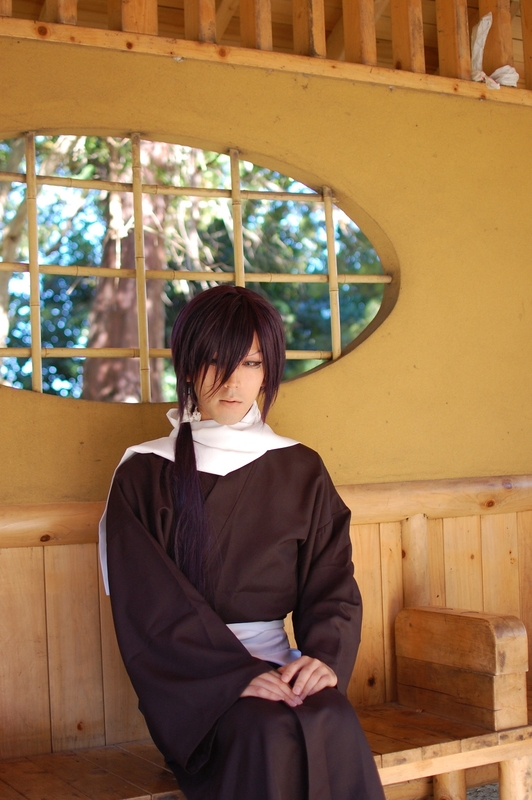 It was the greatest year for me because I cosplayed a lot and had so much fun with you. I would like to make this year better than last year. Please follow me!